Intuitive to manage, Projects contain the information about a particular portfolio project. Image and Video content are linked to a project via a Node Reference field. On project pages, a Views Slideshow block reads in the nid from the url arguments and uses it as a node reference argument to load all Image or Video content associated to the project. SimpleFeed aggregates recent blog posts from Brian’s blog, cascadingStyle.net. 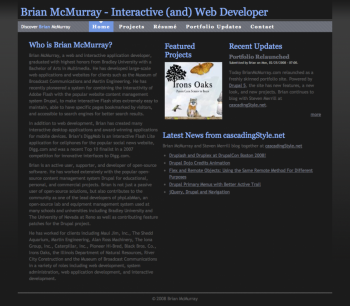 Drupal’s built-in story content is used for the “Portfolio Updates” area of the site. Imagecache handles all of the image resizing and cropping needed for the site. The theme was originally based off Internet Services and then heavily modified and customized by Brian and keeps to the design aesthetic of his blog. The site functions and displays in all major browsers and validates XHTML 1.0 Strict.